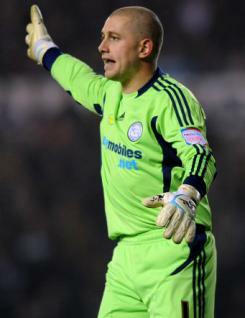 Frank Fielding is a young goalkeeper who was on the books of Blackburn Rovers in 2010-11. A regular for the club?s reserve team in the early part of 2009-10, Frank also gained experience ion loan spells with Leeds and Rochdale. In 2010-11 he was again unable to dislodge Paul Robinson from the ?keeper?s jersey, although he featured on the bench for the first team. Frank spent two spells on loan with Derby County during the season covering for injuries, and produced some impressive performances. He made a permanent move to Pride Park in the summer of 2011. Frank has been capped for England at U21 level.